The lavender season may have come to an end, but things are still cooking at White Hills Farm, a lavender farm in Dearing. Literally. This month the farm will hold two cooking demonstrations by caterer Charleen Tinley – one on Friday, August 3 and the other on Friday, August 24. The events will begin at 10:30 a.m. with a short tour of the property. For the August 3 workshop, Charleen will demonstrate wet and dry brining for meat, fish and poultry. 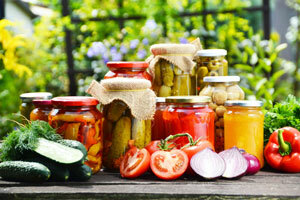 On August 24, she will make quick and easy pickled vegetables. And of course, she’ll share samples for everyone to try. The cost for each workshop, which can accommodate about 20 people, is $10. Guests also are welcome to bring a picnic lunch to enjoy on the property after the classes. “I love for people to learn to cook in the season using fresh, local foods and incorporate them into their everyday lives,” says Amy Sutter, who purchased White Hills Farm with her husband, Patrick, in April 2017. If you’re more into R&R than cooking, however, White Hills has that covered as well. On Saturday, August 4 the property will hold an all-day yoga retreat from 9:30 a.m. to 5 p.m. The event will include morning and afternoon yoga sessions, a spa product workshop, a farm tour and a vegetarian lunch. The yoga workshop is $100 per person. For more information or to sign up for any of the workshops, call (706) 595-5081, email amy@whitehillsfarm.us or visit whitehillsfarm.us. Published on July 25, 2018 in Features, People and tagged front by Kristy Johnson.